Bowls of calves foot jelly - like Saint Nicholas's belly. Weeks spent preparing, such as the fruits for the "big fruit cake" and other treats. On the table were a variety of traditional dishes: flaming plum pudding, egg shaped blanc mange on a nest of "thinly shaved lemon peel," turkey and pork or venison, calf's head or turtle soup, apple toddy and wines. 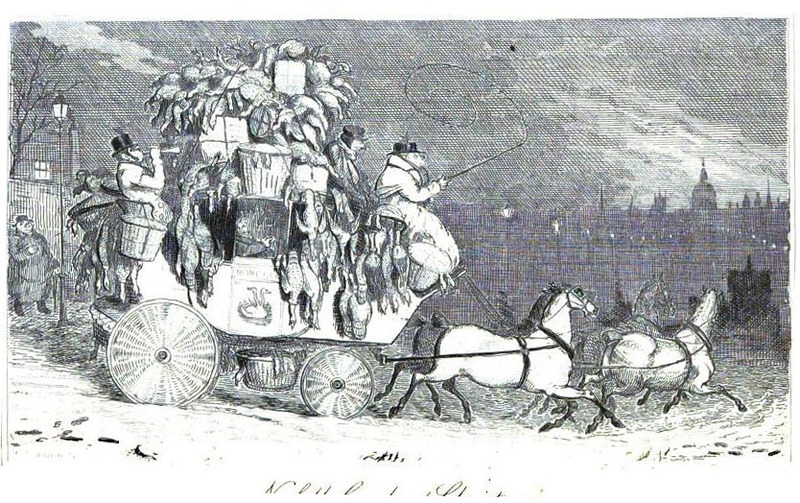 During four days in 1793 over 2500 turkeys were sent by passenger coach from Norwich to London for Christmas. They "pay better" than the usual human passenger. Turkeys also walked to market as seen in the last image.